One of the ways in which electricians in south west London are helping householders to improve their properties is by installing wiring for outdoor lighting, water features and garden rooms/sheds. Very often, as a home owner, you might be tempted to do this yourself. If you intend to run a permanent cable carrying mains voltage electricity through the garden, it is notifiable according to the 17th edition wiring regulations. 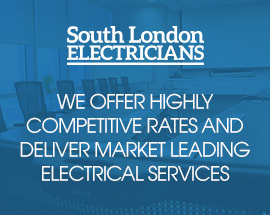 Electricians in South West London to the Rescue! NICEIC, the National Inspection Council for Electrical Installation Contracting, state that there are around 14,500 accidents in UK homes each year caused by faulty electrics. So before you have an electrical disaster, you should call electricians in south west London to check your wiring is safe. Taking a DIY approach to mending electrical problems could be the death of you; a little mistake and before you know it, mains electricity could be passing through your body. So call in a professional fully qualified and registered electrician. It is one of the worst things that can possibly happen to a homeowner. Imagine if you had to choose an electrician and then hire them, only to find that they were less than honest and that they left your house in a state that could well be called dangerous. There are plenty of cowboys out there in the world of electricians, and today we are going to look at ways in which you can avoid these people, and have a good electrician who does a good job for you and your home. While it is safe to say that most modern homes are generally well built and safe, there are some aspects of our homes that we need to be careful about. This is particularly true in the area of the electrical fittings and wiring in our homes. We did not do it ourselves as homeowners, but we do need to be aware that sometimes there can be issues that need dealing with by qualified electricians.